The president’s proposal would cut spending by $62 billion beneath the 2020 spending limits. Implementing the president’s 5 percent cut would ensure that some real spending cuts are achieved, and would stave off another massive deal to increase the spending. After back-to-back years of massive spending increases, it’s not a big ask for agencies to cut spending, and it is the least that Congress can do. President Donald Trump went bold last month when he directed Cabinet members to cut spending by 5 percent for their upcoming annual budgets. This comes nine months after Congress passed its latest budget-busting deal, which sent deficit spending soaring by nearly $300 billion above the Budget Control Act caps. Asking agencies to cut 5 percent next year is a step in the right direction toward fiscal health and smaller government. The president’s proposal would cut spending by $62 billion beneath the 2020 spending limits. Notably, the plan would not infringe upon Congress’ Article I power of the purse. So long as 5 percent of funding is cut, lawmakers would be able to prioritize funding as they see fit, ensuring that key national priorities are not neglected. While encouraging, this 5 percent cut is just a first step. The president and Congress will have to pursue bolder reforms in order to stabilize our growing national debt and avert the looming economic crisis. One question that should be asked is, why wait until next year to implement these cuts? While roughly 75 percent of appropriations for fiscal year 2019 have already been signed into law, there is still over $300 billion outstanding. Congress could cut more than $15 billion from the remaining bills. What’s more, the president could put forth another rescissions package, clawing back unnecessary spending after it’s been appropriated, saving billions more. Since Congress passed the Budget Control Act in 2011, the law has been amended three times to raise the spending caps. Each successive change to the law increased spending and eroded the intent of the law, which was to control the growth of discretionary spending. 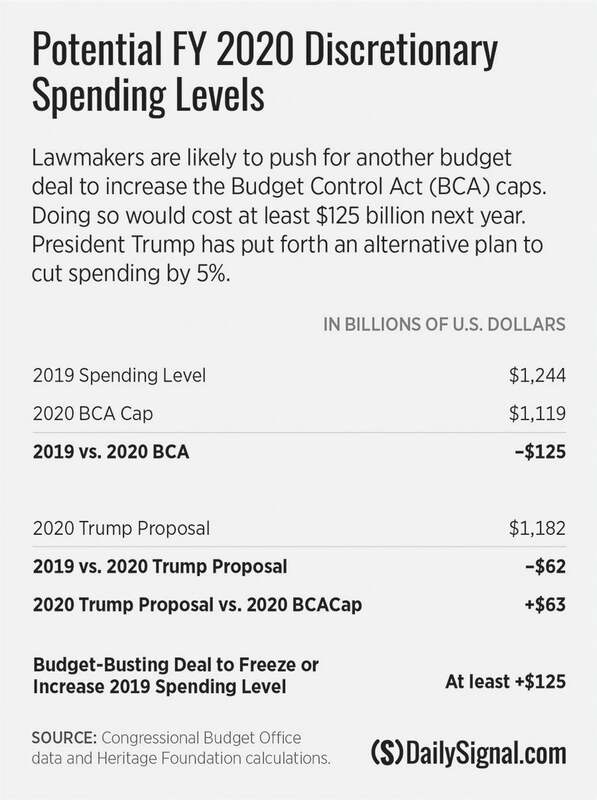 The nearly $300 billion debt limit increase passed earlier this year sets up a large cliff at the start of fiscal year 2020, meaning that Congress is likely to push for another deal to lift the cap in the coming months. Without a commitment to cutting the budget, Congress is paving the way for another massive budget deal for the next two years. Congress would have to raise the caps by $125 billion above the 2019 Budget Control Act cap just to maintain level funding in 2020. Judging by past budget deals though, the number could be much higher. Implementing the president’s 5 percent cut would ensure that some real spending cuts are achieved, and would stave off another massive deal to increase the spending limits. Yet even with the 5 percent cut, spending in fiscal year 2020 would still surpass next year’s Budget Control Act caps by more than $60 billion. A bolder strategy than the 5 percent cut would be to maintain the caps under current law for 2020-2021. Even though the Budget Control Act has been undermined by Congress, it was an effective tool for restraining spending between 2012 and 2017. Reverting back to the caps would save taxpayers $153 billion in 2020. The Heritage Foundation’s “Blueprint for Balance” laid out over $100 billion in discretionary savings that could be realized in a single year. When combined with one-time savings, such as selling government-owned assets, Congress could hit the $153 billion savings goal. Cutting tens of billions of dollars from the federal budget will help restrain the federal bureaucracy and empower state and local governments to take a more hands-on approach in prioritizing activities and funding. But lawmakers must not be satisfied with discretionary cuts alone. Social Security, Medicare, and Medicaid are the primary drivers of spending growth and the national debt. Until reforms are made to address the long-term viability of these programs, the broader federal budget won’t be sustainable. A 5 percent cut in spending is better than another irresponsible budget deal. The Office of Management and Budget has already warned of a $1 trillion deficit in 2019. After back-to-back years of massive spending increases, it’s not a big ask for agencies to cut spending, and it is the least that Congress can do to return some modicum of responsibility to the federal budget. This is a bipartisan solution to the looming fiscal cliff. For budget hawks, it would avoid another massive spending increase. And for Congress’ big spenders, these cuts would be less than half the size of cuts under the Budget Control Act. Most importantly, cutting spending is a win for U.S. taxpayers.